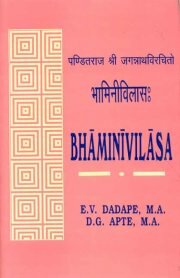 We the Telugu (90% Sanskrit ,Of course) speaking people gratefully acknowledge your efforts in bringing out Bhamini Vilasam to the people.Actually Bhama means beautiful lady.Bhamini means beauty personified.Though Jagannadha Panditha Raya used to call her as Bhamini, her parental name was Kameswari. I am Dr. G.B. Ramakrishna Sastry,(69)a Professor,at Hyderabad.I belong to Munganda((centuries back the name was Munikhanda Agraharam)which is on the on the shores of River Godavari,the birth place of Jagannadha Panditha Rayalu(1590-1667) who was a senior colleague Pandith Raj of Shah- Jehan.His Son'name was Madhava Bhattu.My grand mother (father's mother) was the lastlast blood relation of that Upadrastha family. We the Telugu (90% Sanskrit ,Of course) speaking people grat ..